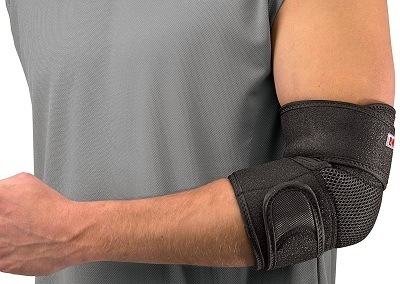 ​In this article, we short-list the top elbow braces that are currently on the market. Our aim is to provide you with the essential information needed to decide which is the best elbow brace for your needs. The importance of an elbow brace, especially to those who play tennis and golf, cannot be belittled. If you need your elbows healthy and efficient at hitting that ball, then you might want to take a step and prevent them from injuries that may arise from a period at the pitch. Tennis players, mostly, are affected by a condition called tendonitis or tennis elbow. This is where the tendons get inflamed, a condition that can be painstakingly painful. More details on benefits of elbow braces will be seen later in this article. Given the high number of elbow brace brands, you may find it a daunting task to choose the best elbow brace for you. Here, we have you covered. We have filtered out all other brands through a selection criteria later explained here to end up with these best elbow braces. The Mueller Adjustable Elbow Brace was created to nurse sore, injured or weak elbows. Ergo, it comes with support features not only for the elbow but also the surrounding areas of the arm; it is a long size brace for maximum support. Like you would expect from a German product, the Mueller brace exhibits high-quality build and performs great. It comes with a blend of neoprene material, which offers the required therapeutic heat to the affected area of your elbow while still maintaining the required pressure to offer support. The warmth provided will relieve you of pain. Adjustable straps stand as the main selling point of this brace; with these, you can have the support your elbows need irrespective of the size of your arm. Unfortunately, this strap is available in one size only and those with slim arms may find the size bulky though fitting. The brace is offered with a HydraMesh fabric panel to ensure breathability, wick the moisture away and keep it comfortable during training. The simple slip-on design and the anti-slip features make this brace easy to wear and make it stick on one position. Most reviewers on Amazon.com cite the durability and comfort of the brace and its effectiveness in offering support for tendonitis and other conditions that affect the brace. Sizing, however, is the biggest complaint as per the reviews. Bracoo is a renowned sports products manufacturer; which is not to mean that their products are always great. However, the Bracoo Neoprene elbow brace is great thanks to its simple but important features. The brace was created specifically to offer support to those suffering from tendonitis and bursitis. Its design ensures that the stress exerted on the joints and your tendons during motion is reduced. To this end, you may want this brace more when you are recovering, but it is also ideal for protection against injuries. It is offered in four-way stretch design, which ensures maximum pressure is exerted on the elbow while not restricting motion. With the right fit, the user will not find it bulky; you even may not realize it is on your elbow while training. It is a long elbow brace, supporting not only the elbow but also the surrounding areas of the elbow. There is only one size for all; if your elbow does not fall between 7 and 13 inches in circumference, then this is not for you. 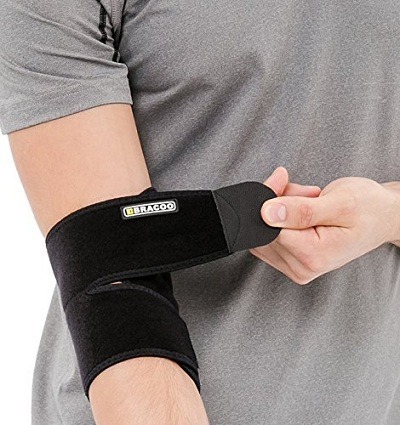 On Amazon.com, the Bracoo Neoprene Elbow support is praised for its effectiveness in offering support to the braces, its durability, and its stylish design. However, buyers complain of its size and unavailability of color choices. Though called a tennis elbow brace, this brace can be used during golf and other training sessions. The design of the brace is specifically to nurse elbow conditions notably tennis elbow, golfer's elbow, repetitive stress motion injuries, elbow hyper-extension and much more. It is offered as a short elbow brace supporting only on the lower part of your elbow and not surrounding areas. Most buyers fancy the way this brace is sold, two braces in one pack with an eBook to get you past the pain issues and a wristband as a bonus. The eBook provided, "Addressing Tennis Elbow Pain", is a guide on how to use this product and resources to help you get past the tennis elbow pain. 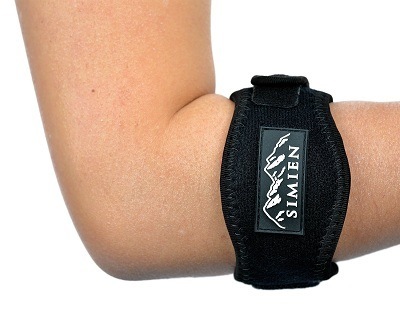 The SIMIEN Tennis Elbow Brace comes in one size fit for all. It is a good fit for men and women and can be worn on either arm making it versatile. Its hook and loop design makes it adjustable for better fit and ensures it does not slip or need constant readjustment during training. It is made of 65 percent neoprene and 35 percent nylon while its logo is made of natural rubber. On Amazon.com, the SIMIEN Tennis Elbow Brace reviews are nothing but praises. Most reviewers cite its effectiveness in dealing with issues such as tendonitis and bursitis while also appreciating the great deal – two braces, wristband and eBook in one package. A few negative reviews touch on the size while the rest touch on durability issues. 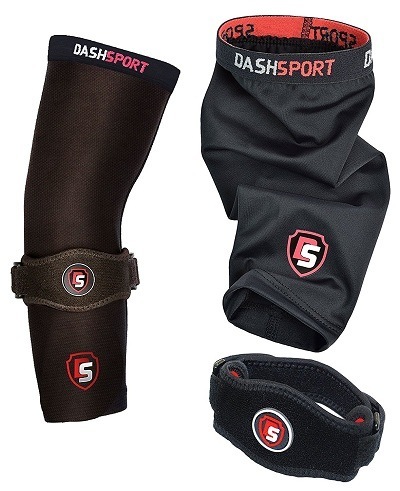 The DashSport Copper Compression Brace, like referred to by the manufacturer, is the original elbow system. It is called this for a good reason; the package comes with an elbow compression sleeve, an elbow brace, and an eBook to guide your through. Using these three items at the same time has been guaranteed to offer pain relief for tennis and golfer elbow. However, you can choose to use the products apart and can be used on either arm. The brace is offered with an adjustable design to ensure that users can get the compression they need on their elbow. It is made of 65 percent neoprene, and 35 percent nylon with copper infused. Copper keeps the brace resistant to odors and bacteria while neoprene keeps the skin warm and protects and relieves the elbow joint of pain. Flat Lock seam stitching design keeps the fabric breathable and allows flexibility during motion. 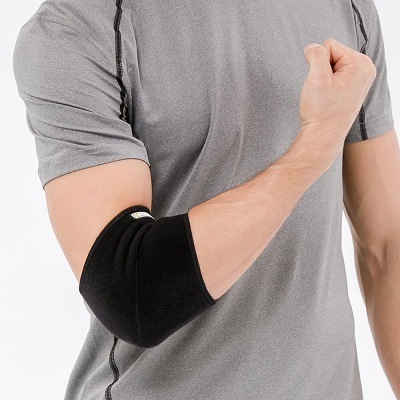 The material will wick moisture away and keep your elbow comfortable during training. This is a short brace, supporting on the lower part of your elbow and not the surrounding areas. It has a generous padding for comfort. DashSport Elbow Brace reviews on Amazon.com are great. 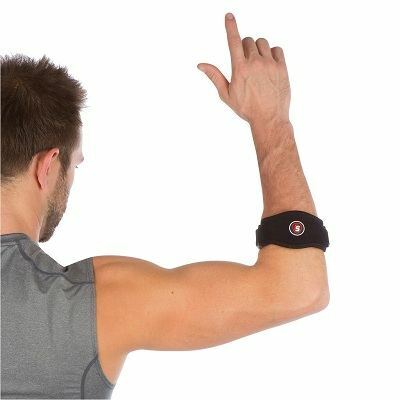 Most reviews hail the brace for its effectiveness in dealing with tendonitis and other elbow conditions. However, a few reviewers do not like the single brace size. Carpal Tunnel Syndrome and tennis elbow have become common in the recent past; the BandIT Therapeutic Forearm Band is medically designed to offer a solution to this problem according to the manufacturer. The band is able to relieve pain without hampering motion or blood circulation. It applies selective pressure on the user's elbow to turn the natural forearm action into a pump thereby reducing tissue swelling and offering enough support. The brace measures 4x4x1.5 inches and weighs 0.6 pounds. This is a one-size-fit for all. With its adjustable design, the brace easily slips on to the arms many of users. It is made of hard plastic with a firm nylon strap. The BandIT Therapeutic elbow brace reviews on Amazon.com praise its effectiveness in dealing with tennis elbow and other conditions. Most say the brace is good for relieving pain, wearing to sleep and in the office after prolonged use of a computer mouse. Negative reviews cite the band's stiff construction, its durability, and its price. If you engage in activities that strain your arms, you will, at one point in your life, experience elbow pains. Usually, these are more common in tennis players, golfers, and bikers but recently, cases of elbow pains have been observed in the common people doing light exercises or just using the computer the whole day. 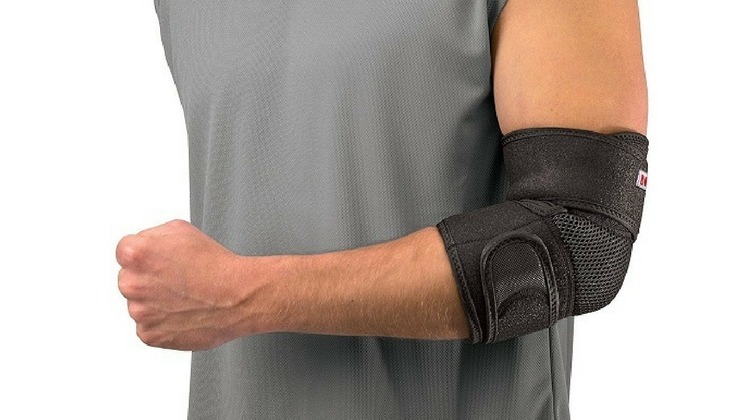 Elbow braces relieve you of the elbow pain that comes with arm movements. 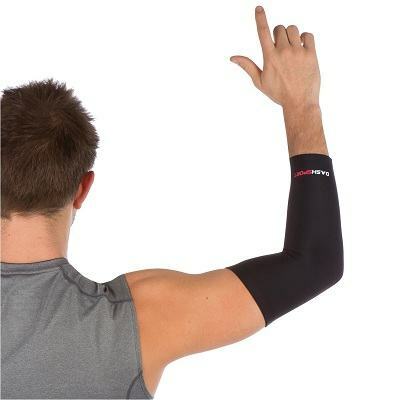 Elbow manufacturers recommend them for tendonitis, bursitis and carpal tunnel syndrome among others. The braces do this by ensuring efficient blood flow and exerting pressure on the affected area for support. The long designs support the elbow and the surrounding parts, and offer protection in case you slip and fall. An elbow brace is considered an inexpensive alternative to therapy. You spend less time and money alleviating pain and staying safe on the field. Though most braces are offered in single size fit-for-all, you should ensure whether you need the right length to support your elbow alone or your elbow plus the surrounding arm. 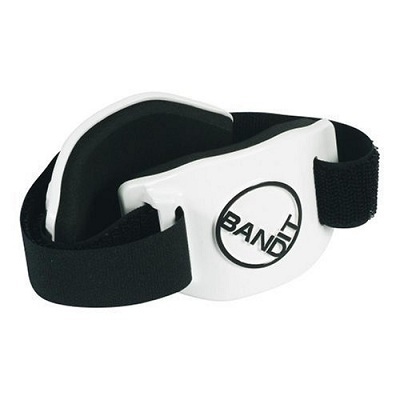 Your conventional brace is made of neoprene blended with nylon. If you get a brace where copper has been infused, provided it offers other great features, take it. The brace you choose should be easy to slip on and should stick to one position – a feature that is normally enhanced by adjustment straps. You also need to ensure that the brace falls within your budget and offers a great performance/price ratio. The Mueller Adjustable Elbow Brace is our choice, and we recommend it based on its overall performance. It supports areas surrounding your elbows, offered with breathable fabric, helps retain warmth around your elbow and keeps blood circulation steady, offered at a great price and is durable enough to endure daily washing. On top of these great features, the manufacturer goes ahead and offers 100 percent money back guarantee on products that do not meet the buyer's expectations. According to customer reviews on Amazon.com, Mueller offers great customer support making it easy for buyers to get exactly what they need. This may be the best elbow brace for you if you need a versatile brace. However, make a comparison with the rest of this review to get the best fit for you.